Today’s entry will be all about shawls. I have two finished shawls to present, one you haven’t seen at all before, and the finished Friendship shawl, alias Swallowtail shawl.I talked my older daughter Hanna into modeling the shawls. The first shots were like this, but then I managed to calm her down and make her behave in accordance with what you except of a shawl model. Elegance and ladylikeness can be very far from what a teenager is. 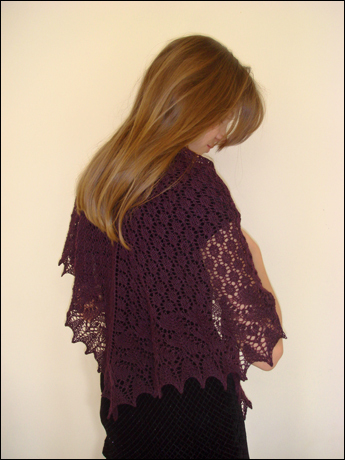 The sharpeyed have perhaps seen that there has been something called the Ti-to-tip shawl in the sidebar. This is a shawl I started and finished last autumn. My son had a period of practice in a hospital for elderly people, and had for five weeks to be on the other side of Helsinki at seven o’clock in the morning. My schedule was to wake up at five, take out the puppy for his morning business, wake up the son and keep him company while he breakfasted before I headed back to bed for one hour of sleep after he had left. While being up I knitted on this shawl, it was simple enough for those very early morning hours. 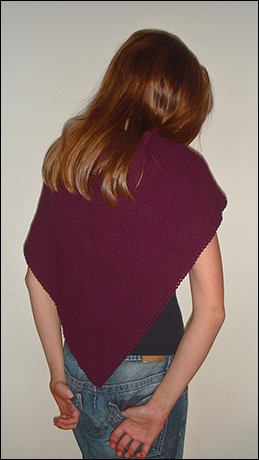 It’s a very simple garter stitch shawl, you cast on three stitches, and on every row make a yo before the last stitch. 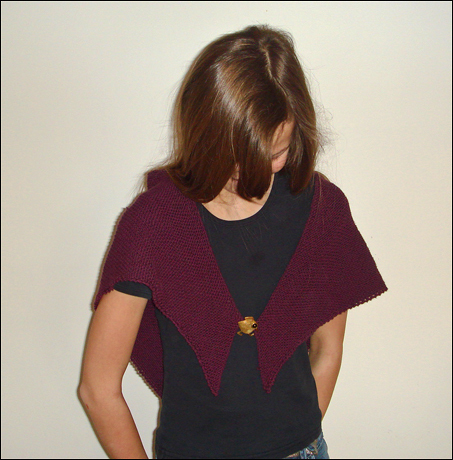 The shawl is inspired by the shawls the American illustrator Tasha Tudor wears over her everyday dresses. I had some Rowan WoolCotton left, and used up everything for this shawl. It’s very everyday, warm and snuggly, and perfect to have under your jacket on cold days. It’s knitted on 4 mm needles. The shawl pin is by a Swedish designer who had a shop in Malmö, unfortunately I don’t have his name anymore. I like it a lot. The Swallowtail shawl, renamed to the Friendship shawl, got finished almost exact one year after I finished my first Swallowtail shawl, a present for a dear friend’s birthday. It’s a tad bit bigger than the original, knitted with five more rows of buds. The Lily of the valley pattern matched exact with the extended bud pattern part, but the border pattern didn’t match. I simply left out the last decrease on the first row before the mid stitch and the first after the mid stitch, and after that did everything work out right. This bigger version used two hanks of Wetterhoff Sivilla, while the original version used one and a half. I had serious problems with the nupps on the original Swallowtail shawl, and I'm happy to report I managed better this time. The pointier bamboo needles grabbed the yarn, and even if it wasn't fast working, it worked much better than what it did with metal needles. I'm still waiting for the lace needles I ordered eons ago, so I don't know if it would have worked even better with them. Pattern: Swallowtail shawl by Evelyn Clark in Interweave Knits Fall 2006. Yarn: Wetterhoff Sivilla, two hanks in colour 916. Needles: 3.5 mm Addi bamboo circulars. 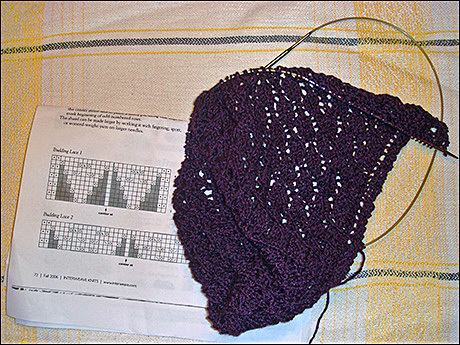 Alterations: Shawl made bigger by knitting five more pattern repeats of the bud pattern. I have a new wip to present, one that is simply flying off the needles (in spite of all the colour changes), and new pictures of Chuck's Cabled socks. The second sock has already reached the heel, and will soon be finished. It's amazing how fast the knitting will advance when you have only half the amount of cables left! This autumn has in many ways been a demanding one. The puppy has brought lot of happiness into what otherwise would have been a quite grey and though period, but he of course did bring with him a lot of work. As a result, the knitting love has been quite absent all autumn long, a fact you sure have seen in my very infrequent posts. They have been infrequent because there has been no knitting going on. But last week, I don’t know why, but I could feel it return, first as just a small tickle, and then in bigger force. Yesterday after our older daughter’s birthday party I picked up my needles and continued knitting on my second Swallowtail shawl. I had cast on almost right after finishing Ene, but never got very far. Now I have finished twelve rows of the bud pattern, wow! The yarn for this Swallowtail (remember, I knitted one back in February) is Wetterhoff’s Sivilla, a lovely merino-silk yarn, and I'm using 3,5 mm Addi circs. I have three skeins and my plan is to make this Swallowtail a bit bigger than the first. I have from several sources heard that five more repeats of the bud pattern are what are needed in order to make the second pattern work out even. That will of course bring me many, many more nupps to finish, but on the other hand, I’m in no hurry. The yarn for this shawl was bought back in October together with the same friend who received the first Swallowtail. I've decided to call the shawl the Friendship shawl, as a reminder for myself of what friendship can be.
" A friend is one to whom one may pour out all the contents of one's heart, chaff and grain together, knowing that the gentlest of hands will take and sift it, keep what is worth keeping and with a breath of kindness blow the rest away."